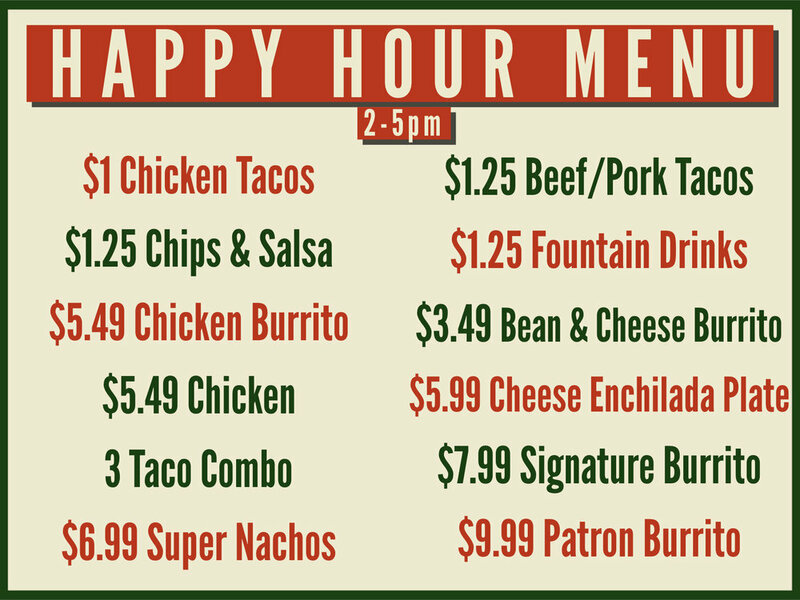 Between Taco Tuesday, $5 Friday, and our new Happy Hour menu, it's hard not to get a great deal at Fresco. Check out our full list of specials and offers below! Available between 2-5 pm everyday, our Happy Hour is a game changer. $1.25 tacos everyday? Check. $1.25 drinks? Check. 2 cheese enchiladas with rice & beans for $5.99? Check. Come between 2-5 pm to get the best bang for your buck in all of Bakersfield! All day every Tuesday, we offer up one of the best Taco Tuesdays in town - $1 for all our traditional tacos with no limits on quantity. That includes shredded beef, grilled chicken, al pastor, and more! You can even order ahead of time by phone or by clicking here. This program is a triple whammy - 1st you get a free large drink for signing up by inputting your phone number into our tablet. 2nd, you get 50% off 1 entree + drink every 5th time you check-in. 3rd, we send you occasional text messages with awesome specials. If you don't want to miss out on great deals, come by and join the list ASAP! Every Friday, we choose one of your favorite items and slash the price down to just 5 bucks. We've offered Super Nachos, Super Fries, Signature Burritos, Enchilada Plates and much more. We post the special on our Facebook page every Friday morning so make sure to follow us by liking our page here! And if you'd like to receive emails about our latest menu changes, promotions, and Fresco news, sign up below! Only Sign Up If You Like Free Mexican Food & Specials! We send out a handful of promotions and specials every month ranging from $5 Signature Burritos to 500 Fish Taco Giveaways. To take advantage of all we offer, sign up below! We respect your privacy and allow you to unsubscribe at any time.